Being the Tourism Capital of Jamaica, Montego Bay or Mo'Bay as the locals call it, is also known as "The Friendly City". But there is more to discover in this second city, among them, are the romantic sunsets and its exotic Jamaican cuisine, waiting for you to explore. Find your favorite restaurant from the list. For every vacation, we always have something we want to bring home from the valued destination. These may either be as souvenirs we can keep for our own collection or as gifts to those close to our hearts. Whatever and for whoever it is, Montego Bay has everything you need to keep the memories alive. The charm of Montego Bay cannot be compared to anywhere else, its lush mountains, exotic rainforests and white sand crystal clear waters that ring around the island will truly be among the best wonderful experience in the Caribbean. 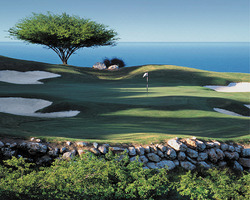 Check out some places worth your time on your next Caribbean golf holiday. Rolling across 400 lush acres between the majestic Jamaican Mountains and stunning Caribbean Sea, Cinnamon Hill Golf Club is one of the Caribbean's most unique golf settings. Highly ranked by Golf Digest and Golfweek Magazine, the course combination of beachfront holes, towering stone aqueducts, ancient gravesites, cascading waterfalls, exotic flora and centuries-old Great Houses is unmatched. 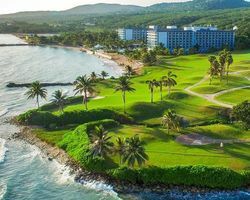 The open, windswept front nine features holes just steps from the azure Caribbean Sea, while the tighter back nine gently climbs over 300 feet into the Jamaican hillsides, affording panaramic views of the tropical countryside and Sea. The 18 hole, 6,828 yard (from the tips), par-72 Cinnamon Hill Course Signature Hole is the 453-yard, Par-4, fifth. A solid drive to avoid bunkers left and one right will be rewarded with a mid-iron approach to the peninsula-shaped green mostly surrounded by the Sea. The Sea still beckons at the par-3, 160-yard sixth known as "Witches Reef". Enjoy spectacular views from the tee box (Jamaica's most northern point), but avoid the right side where a sliced shot will most likely find the lapping waves of the Caribbean. As the course ascends into the Jamaican hills on the back nine, the site's vibrant history is revealed. Various landmarks will get your attention, as well as the golf course - a centuries-old stone aqueduct and gravesites abutting the par-5, 17th green, and waterfall behind the long, par-3 15th green where a famous scene from the James Bond thriller "Live and Let Die" was filmed! Our 18-hole golf course is acclaimed by industry experts and amateur golfers alike. Half Moon’s course was designed by the legendary Robert Trent Jones Sr. and modernised by Roger Rulewich, creating a masterpiece of sheer beauty and game-raising challenges. 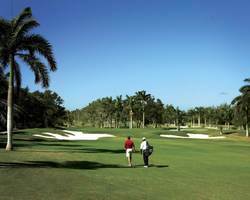 Many official PGA tournaments also have been held at Half Moon, including the European PGA Senior Tour and, since 2007, the Jamaica Open. Just four minutes away from our golf course are the White Witch and Cinnamon Hill golf courses, making Half Moon a golf destination. Winding through the mountains of Jamaica's historic 5,000-acre Rose Hall Plantation, The White Witch Golf Course is carved out of 600 acres of lush greenery and rolling countryside that features panoramic views of the Caribbean Sea from 16 of its 18 holes. Considered one of the finest golf courses in the Caribbean, White Witch was built on land once part of Rose Hall Sugar Plantation. The course was named by its creators - golf course architects Robert von Hagge and Rick Baril, after Annee Palmer - the "White Witch", who was mistress of Rose Hall in the early 1800's. She was purported to be beautiful and beguiling - having done away with several unsuspecting husbands. The par-71, 6,859-yard golf course winds its way across mountainous terrain with naturally lush landscape, colorful foliage and is recognized for near perfect conditioning. As Caribbean golf courses go, White Witch is truly one of the most scenic with panoramic sea vistas and island views adding to guest golfing enjoyment. The Men's USGA course rating and slope is 74.0/139, Women's USGA course rating and slope is 73.2/126.